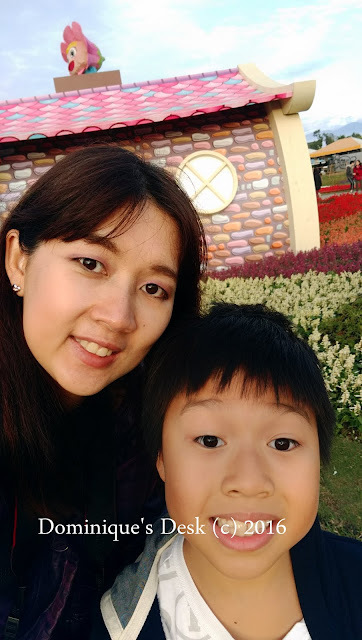 I have love viewing flowers and was fortunate to be able to visit the Agricultural and flower exhibition while on vacations in Taiwan. During the previous trip to Taiwan I saw lovely flowers at Taoyuan when we stopped by a sunflower garden. This time we didn’t see any special flowers but an array of typical wild flowers. There weren’t many different flower exhibits and being the last day of the flower show.It was not really crowded when we were there as we went about one hour before closing time. There were fields and fields of colorful flowers at the arena . The different color daisies brightened up the place. I certainly would like to have a bunch of the daisies in a vase on the dinning table if I could. It was a great afternoon being among the flowers and the kids enjoyed being among nature that day. Have you been admiring flower too? Wonderful photos. The one with the field of flowers is just stunning. Great flower photos and love you and Doggie boy, your kidsa re darling! Nice! I love flowers and flower fields. Wish Singapore had more space for stuff like these. Beautiful flowers! Must have felt like Spring. Beautiful photos! Looks like a fun day. This place looks lovely and so colorful. I would love to visit this place too.